Scallops and Bacon…Two fabulous ingredients that marry so nicely together. 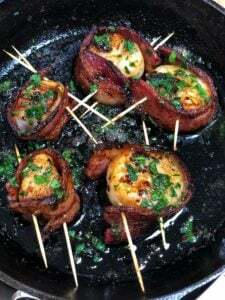 Here’s my take on the traditional recipe for Bacon Wrapped Scallops. My version brings the sweet and heat. 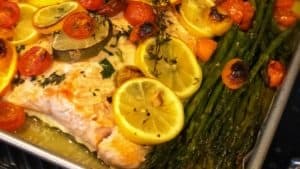 This is a great recipe for a dinner or holiday party. Your guests will love…so make extra! Local to Charlotte? Head on over to The Carolina Meat & Fish Co. and ask for a pound of dry-packed scallops and thick-cut bacon. 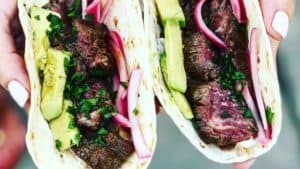 Grab your cast iron pan and let’s get appetizing! 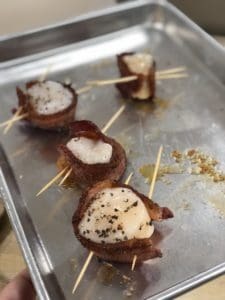 So one of my pet peeves when eating Bacon Wrapped Scallops is that the bacon is never crispy enough…using my techniques…you will be have a super crispy, “bacony” outside and tender scallop inside. Heat a cast iron pan to medium. 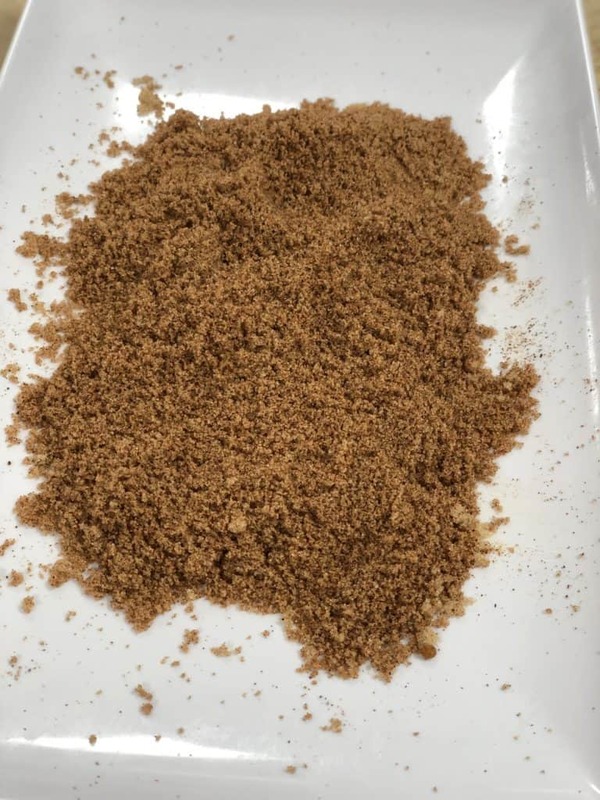 Mix the brown sugar, chili powder and cayenne together on a flat surface. 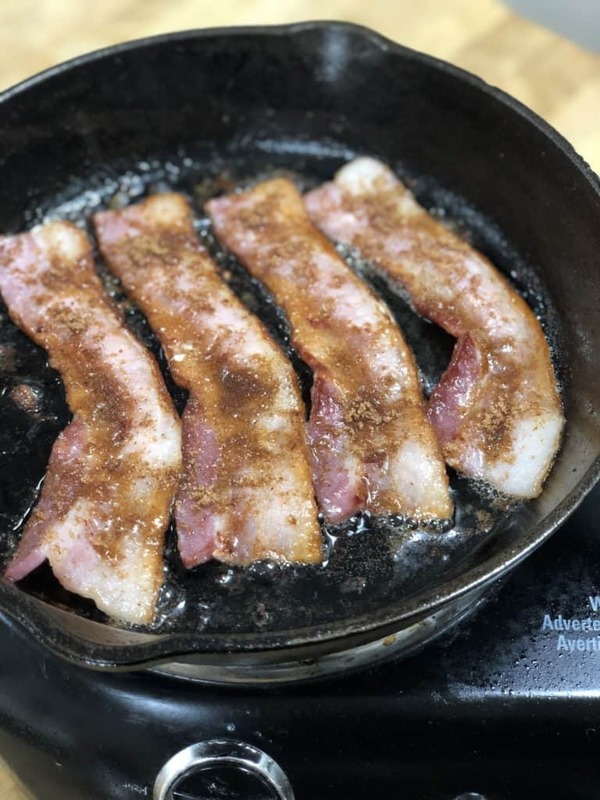 Place your bacon in the pan and fry for about 2 minutes each side. While the bacon is frying, rinse your scallops, pat super dry with a paper towel and sprinkle with black pepper. Sprinkle the sugar mixture on one side of the bacon and allow to cook for about another minute…do the same with the other side. The bacon, at this point, should start to become crispy, but yet still pliable. You want the bacon to be flexible enough to wrap around the scallop and not break. 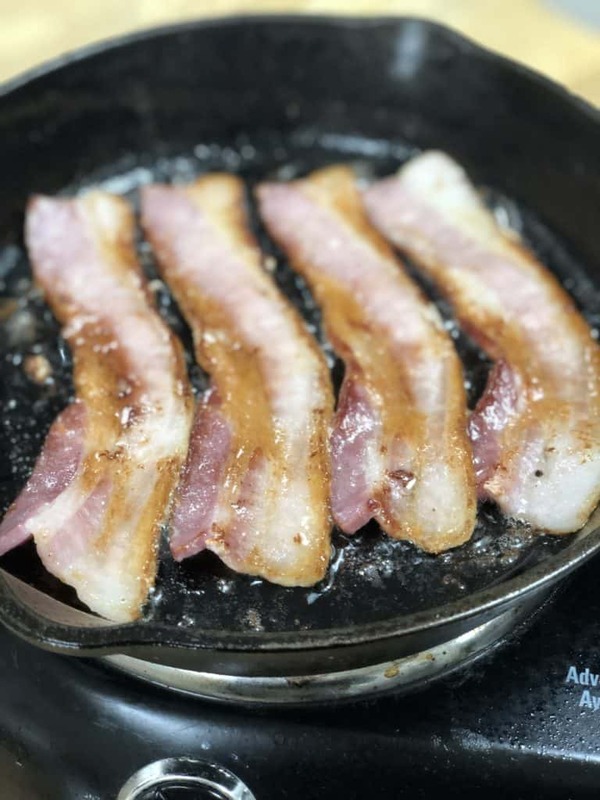 Remove bacon from pan, allow to cool just enough to handle. Wrap one piece of bacon (depending on the size of the scallop, you may have to cut the bacon to fit…do NOT cut the bacon prior to frying) around a scallop and secure the end with a mini skewer. Add a second skewer in the middle for added security. 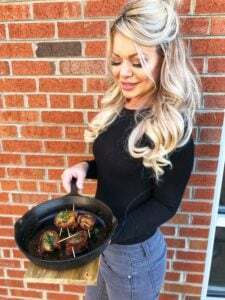 Place the bacon wrapped scallops back in the cast iron pan and sear on both sides. This should take only about 1 1/2 to 2 minutes per side. You will notice the scallop start to brown and caramelize perfectly. Garnish with the fresh parsley and ENJOY! Love bacon? 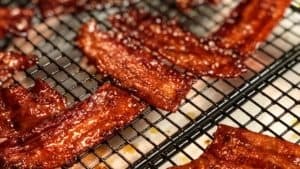 Click here for my recipe for Candied Bacon…a definite crowd pleaser!